He is a mechanical engineer and electrician at the National University of San Agustín de Arequipa. He also holds an MBA from the Pontifical Catholic University of Peru. He is currently in charge of the Mine Maintenance and Reliability Engineering Superintendence at Hudbay Peru. He has more than 16 years of professional career. Tell us a little about your company and how you got started. Hudbay is a Canadian mining company with 90 years of experience and mining operations in various parts of the American continent. In Peru, it operates the Constancia Mining Unit, located 4,500 meters above sea level in the province of Chumbivilcas in the department of Cusco. Since 2013 I have been part of Hudbay Perú as Superintendent of Maintenance Mine, in charge of the supervision of the maintenance of our equipment. That is why I had the experience of participating in the assembly of all the mine equipment, as well as in the beginning of the tests of the Hitachi equipment in our operations. Thanks to the good performance of these trucks, we made the decision to acquire the first three Hitachi EH4000 trucks in the country. What are some current jobs you’re working on? We are currently focused on new maintenance strategies, mainly to extend the life of components based on reliability. We are implementing multiple monitoring and reliability tools for this purpose. On the other hand, we are implementing some control improvements in our fuel and lubricants with good results at competitive cost. When and why did you start using Hitachi Mining Equipment? We began to use the Hitachi EX5600 shovels from the beginning of our operations, for the good performance of the brand and the support to other operations in the country. What type of work do you use Hitachi shovels/trucks for? How have they performed? 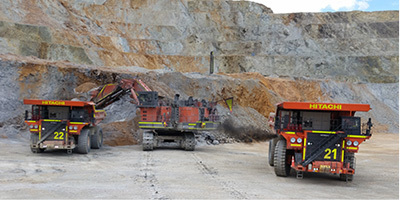 The three shovels we have at the Constancia mine site are for earth movement, both for ore movement and for overburden. The three Hitachi trucks along with the hauling fleet perform well. Have you used other brands of shovel/truck? How does Hitachi compare? What would you say Hitachi is known for? Yes, by comparing the Hitachi truck with its type (electric trucks), I consider that its brake system and descent control is very reliable and easier to control. The Hitachi brand is known for its highly level of confidence. Why do you continue to use Hitachi? 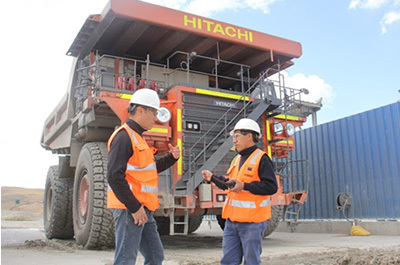 Hitachi is known as a leader in the mining industry. Their slogan is "Hitachi To The Core." What does that mean to you? 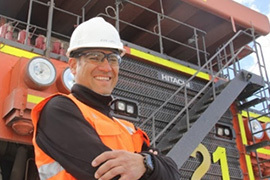 Hitachi focuses on the requirements of its customer, which in our case is safe and responsible production with the highest standards of safety, environment and operational excellence in the Constancia Mining Unit. Are you "Hitachi to the Core?" It is an interesting motto and we congratulate them for the service initiative.